The Cold War. A dangerous time for the world. A dangerous time to be a spy...but that's exactly what being a spy is all about. As the shadowy clouds of intrigue and subterfuge settle across the globe you have been called upon by your country to obtain the Top Secret information that will ensure your country's safety and supremacy. But not all is as it seems; your spies are difficult to control on a global scale, and even worse, there's a Double Agent in your midst who threatens the entire mission! 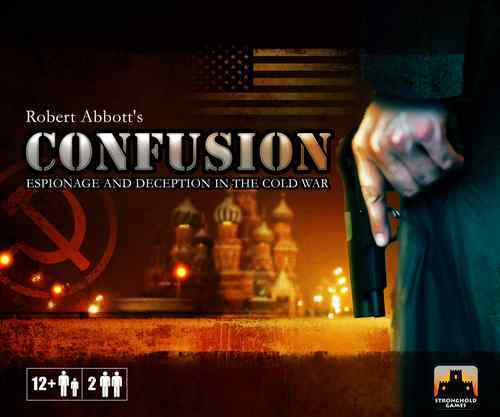 At the start of the game of Confusion, players aren't aware of the talents and skills their spies possess. Your opponent can see what your spies can do, but you cannot. Your job as a wise leader is to first deduce exactly how each of your spies move, then employ your knowledge by using each spy for maximum effect. But be on alert, because your opponent has placed a Double Agent in your team of spies! The first player to take the Top Secret Briefcase from the middle of the board and deliver it to his opponent's capital is the winner.